Crazy coronary care : Intentional , unitended delay during primary PCI for STEMI ! A patient with chest pain is being rushed into the ER of a medium sized cardiac facility in an urban county of India .The fellow briefs the senior consultant cardiologist about the arrival of this extensive anterior STEMI over phone. The consultant enquires about the “symptom to door time” and was little concerned when the fellow said ” it is only 2 hours sir” .The fellow was amused with the consultant’s reaction. Cardiologist : It is a massive heart attack . One of your coronary artery got blocked suddenly , I have to remove the block at the earliest . There are two ways of doing it . One is fibrinolysis which lyses the clot .It can open up your vessel , though incompletely but would prevent myocardial damage at the earliest . The other one is PCI , which if performed rapidly will completely open up the vessel in question , what we call TIMI 3 flow , But it has to be done within one hour. Patient : Which is better doctor for me ? Cardiologist : My cath lab logistics does not allow me to do a PCI within the stipulated time , still I wish to perform a primary angioplasty as i am not a believer in thrombolysis ! Patients spouse : Doctor please save my husband . You start the fibrinolysis every minute is risky isn’t doctor , and do the PCI once its ready doctor . No . . . Fibrinolysis does not combine well with PCI in fact it will worsen the situation . Thats what FINNESSE study says . We can do only one of them . . . not both . Cardiologist: By the way , what is your insurance limit sir ? Cardiologist : OK , that should be suffice 90 out of 100 times . Any way keep another lakh ready in case I need IABP. Patient : My pain is worsening doctor at least relieve my pain till this debate is over ! Cardiologist : I am sorry , you have come too early for PCI . Guidelines do not allow me to choose PCI in the first hour as our anticipated delay for PCI is more than 3 hours . I wish you arrived after the 3 hour window . “Of course you are on time for thrombolysis” which unfortunately I am against ! Now, I am going to wait ( You may think it is a waste of time i call it as patient preparation time ) .This waiting period incidentally allows us to cross three hour time window , then the issue of not lysing does n’t creep in at all . 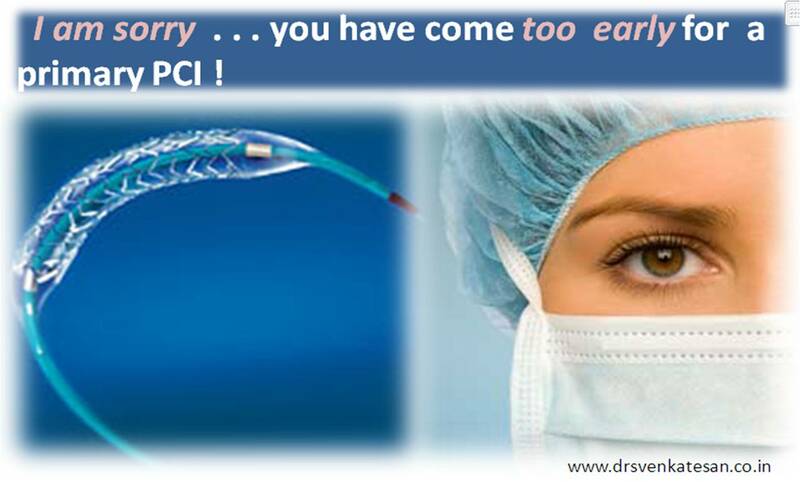 A PCI done after 3 hours is not a race against time , while a PCI done early is like a power play in cricket . I do not know whether this delay which is happening right now – Intentional /Unintentional, Scientific / unscientific reasons would damage your heart or not ! Since you have an extensive MI , I earnestly believe with all my wisdom and knowledge, you will do well with primary PCI even if i do it little late . Please allow me to violate the standard criteria in the interest of your heart . Cardiologist : I wonder , if you had arrived little late we wouldn’t be discussing this terrible conversation at all .Your myocardium will also feel thrilled for getting a better mode of re-perfusion. You put me in an awkward situation by coming early ! Patient : But . . . doctor every one tells me , one should reach the hospital after a heart attack at the earliest is it not ? Please believe me doctor , I made extraordinary efforts to arrive early to your hospital , but you have put me on hold doctor ! Cardiologist :I agree . . . but you won’t understand the modern jargons in interventional cardiology , some times (Or is it many times !) we will be doing the diagonally opposite to what is preached in text books . Both intentional and unintentional delays are common in the emergency cardiac care . Do not bother about it . . . science will take care of it ! Patient : You mean . . . you are going to waste the golden hour in STEMI by simply arranging for cath lab staffs and machinery . Cardiologist : You got the point right ! Just sit back enjoy the flight ! Patient : Your wish is my wish doctor . Please handle with care doc ! * Please note this is an imaginary conversation ( Most often happens in silent mode !) in many of the cath labs which do not have 24 hour service. In a country with 100 crore population like India , less than a dozen cathlabs work round the clock . Guess how often such a situation would come in day to day cardiology practice.